BW&BK Report: Heavy T.O. 2012 – Here’s Mud In Yer Eye! Posted in: From There To Here.... Tagged: BW&BK, Deftones, Heavy T.O. 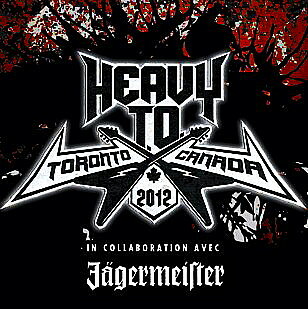 2012, Kataklysm, Overkill, Slipknot, Suicidal Tendencies, System Of A Down. For the record, I love Toronto. Sure, the public transit system isn’t fit to service Legoland let alone a bustling metropolis, the cost of living has punched a hole through the roof, and we have a mayor with less credibility than your average high school junkie hall monitor, but it’s my home. I was born and bred here, I got my metal skooling during the righteous and never-to-be-repeated Gasworks/Rock N’ Roll Heaven era. Even so, when word came down in 2011 that Hogtown was going to echo Montreal’s highly successful weekend metal festival Heavy MTL – launched in 2008 – with a two day thrash-and-burn open air of its own in Downsview Park, I was skeptical. I had no doubt the organizers would pull things together in order to make it happen, but far less confident it would last more than a single “nice try” run. Having lived in Germany since the tail end of 1995 as BW&BK’s European correspondent, I’ve attended my share of metal festivals great, good, bad and painfully ugly. Every weekend between May and September the classic metal festival model is put into action somewhere on the continent, attracting rivet-heads from all walks of life by the thousands and tens of thousands for two or three days of distortion and debauchery. It’s this model on which Heavy MTL was based – and succeeded – thanks to the European mentality of the Québécois. I didn’t see Heavy T.O. having the same impact in a city where metalheads are about five steps less committed to getting off the couch when a show hits town (sorry, it’s sad but true).